Since it came on to the scene over a decade ago, VoIP services have rapidly overtaken landlines to become the most popular type of business phone system in America. Today’s business phone systems connect people from across the globe using the cloud. For a fraction of the cost of a landline, you can make and receive calls from any internet-enabled desk phone, computer, smartphone or tablet, while retaining a professional image at all times. To help you choose the right VoIP service for your small business, we’ve reviewed dozens of top providers to bring you the top three integrated phone systems for your business. They strike the best balance between cost and functionality. Read on for our pick of the best VoIP services for small businesses in 2017. VoIP stands for Voice over Internet Protocol (VoIP). VoIP uses the internet to make and receive calls, so you can make calls cheaply to people near and far for as little as $5 a month. The key difference between VoIP and landlines is that landlines use a physical wire connection to make calls, whereas VoIP uses the internet, usually bringing down the cost of your business phone line considerably. Unlike landlines, which require physical installation, the core infrastructure and network of VoIP phones is stored in a data center and delivered to your business over the web. This means that the service can be “switched on” remotely and start working straight out-of-the-box. Many businesses opt for a “hosted” VoIP solution. Hosted solutions are systems where the data center is stored and managed outside the office. Usually, the premises is the provider’s headquarters or regional office. Hosted VoIP services are a popular option for small businesses because teams don’t need to worry about pricey capital investment or the hassle of installing and managing complex hardware in the office. If you ask telecoms experts who is the best VoIP provider and why, you’re sure to get a range of answers. There is no perfect solution. All of the major VoIP services have pros and cons that you should consider before you make a purchase. It’s important to look for the VoIP provider that will be the best fit for your business, instead of the one that is the cheapest or comes with the most impressive list of features. Pro Tip: Sit down with your team and decide on the features and level of performance that you need. Then consider whether these needs will change over the next 12 months. Once you’ve got a list, shop around for the VoIP services that satisfy those requirements without overshooting them. When you’re a small company, it’s important to keep costs to a minimum and only pay for the features you actually need. Don’t forget that if you find yourself in need of extra features in the future, most companies offer flexible plans. This means that you can change your plan later if you need to. Scalable Plans & Pricing – Choose a provider that will grow and shift alongside your business. Quality Service – Make sure that the provider delivers high-quality audio and video at all times. Little to No Downtime – How often does the provider shut down for upgrades and maintenance? Customer Support – What support options does the provider offer? And where is the center based? The gold standard is 24/7 U.S. based customer support from trained technicians. Skype has come along way since it launched in 2003 as an instant messaging app for friends and families. Since Microsoft bought Skype in 2011, its product offering has massively expanded and the company has seized a significant share of the U.S. business VoIP market. Skype for Business lets teams hold meetings and share their files and screens in a centralized app. Its integration with Office 365 lets you effortlessly see your contacts’ statuses, schedule meetings in Outlook and start chats from Microsoft Office apps like Word and Powerpoint. Plans start from as low as $5.00 per month per user, making it a highly affordable option for entrepreneurs and micro businesses. If you take security seriously, you’ll also be pleased to know that all your conversations are protected by strong authentication and encryption automatically. This promise should come as a relief to many business owners who may have concerns about their data security with such a small price tag. RingCentral Office is designed with the needs of fast-growing teams in mind. If your team has five or more staff, this VoIP service may be for you. Founded in 1999, RingCentral is one of America’s leading cloud-based telecoms specialists. The company prides itself on providing businesses with premium, yet user-friendly VoIP products. While RingCentral Office is a big step up in price compared to Skype for Business, it’s also a big step up in terms of features. 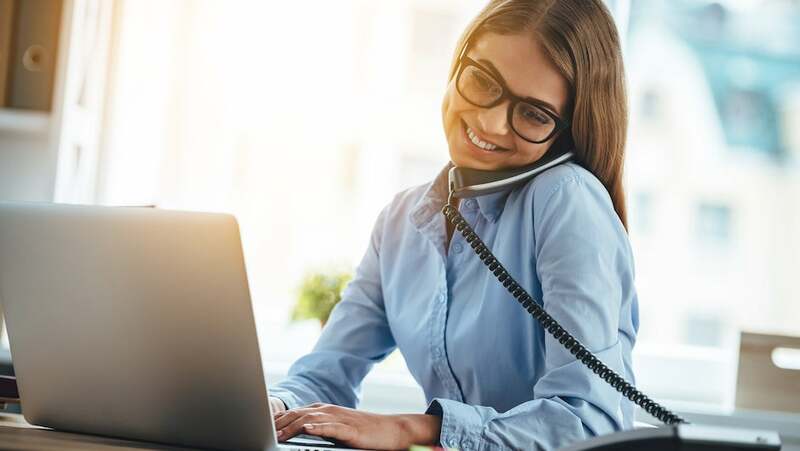 Advanced call management features paired with round-the-clock customer service make RingCentral Office an excellent option for teams that want a premium service for a reasonable price. Vonage is a market leader in residential VoIP, but in recent years it’s taken on the business market too. Like Skype for Business and RingCentral Office, Vonage offers VoIP plans for a fraction of the cost of a traditional provider – just $39.99 per user per month. While Vonage is on the high end in terms of price, if your business receives a high volume of customer support calls it’s worth it. A real highlight is the “Vonage Box”: a small, router-like device that you connect to your network. The “Vonage Box” lets you plug your existing desktop phone right into the box, giving you the ability to use your own phone instead of your PC to make and receive calls from the moment it arrives. Vonage also includes several valuable features in its plan to improve your customer service, including visual voicemail, voicemail transcription, SimulRing® (multiple devices ring when you get a call), call logging and robust call forwarding options. Microsoft Skype for Business, RingCentral Office and Vonage Business are just the tip of the iceberg. There are dozens of voip services available to businesses. If you are planning to upgrade your business phone system, we suggest that you shop around before signing up to a trial with any one provider. Finally, don’t forget that most providers will give you a custom quote if you request one. Check if you’re eligible for custom quotes and make use of these offers to find the best deal. Read more small business and startup advice on TechCo. Content marketing and creative enthusiast at MVF. Interested in tech, gadgets, startups and entrepreneurship. I'm an ideas person.